Pancreatic ductal adenocarcinoma (PDAC) is among the most deadly solid tumours. This is due to a generally late-stage diagnosis of a primarily treatment-refractory disease. Several large-scale sequencing and mass spectrometry approaches have identified key drivers of this disease and in doing so highlighted the vast heterogeneity of lower frequency mutations that make clinical trials of targeted agents in unselected patients increasingly futile. There is a clear need for improved biomarkers to guide effective targeted therapies, with biomarker-driven clinical trials for personalised medicine becoming increasingly common in several cancers. Interestingly, many of the aberrant signalling pathways in PDAC rely on downstream signal transduction through the mitogen-activated protein kinase and phosphoinositide 3-kinase (PI3K) pathways, which has led to the development of several approaches to target these key regulators, primarily as combination therapies. The following review discusses the trend of PDAC therapy towards molecular subtyping for biomarker-driven personalised therapies, highlighting the key pathways under investigation and their relationship to the PI3K pathway. Accounting for ~95% of pancreatic cancers, pancreatic ductal adenocarcinoma (PDAC) has a very poor overall 5-year survival of 8% and is predicted to be the second leading cause of cancer-related deaths in the developed world by 2030.1–3 This has only marginally improved since the introduction of gemcitabine in 1995.4 5 Surgery remains the only curative treatment and is often applied with adjuvant chemotherapy, but as few as 10%–15% of patients are eligible at initial diagnosis.6–9 Most patients with PDAC have few or non-specific symptoms as the tumour develops, and this means that a large proportion are diagnosed at a late stage, already presenting with locally advanced or metastatic disease.10 For those patients that are not immediately eligible for resection, neoadjuvant chemotherapy can be given to reduce borderline tumours prior to resection.11 Recent clinical trials aimed at improving response to chemotherapy have demonstrated improved survival with patients treated with either a combination of gemcitabine and nab-paclitaxel or FOLFIRINOX (folinic acid, 5-fluorouracil, irinotecan, and oxaliplatin).12–16 However, patient tolerability may be limited with such aggressive treatment regimens.16 While improvements in surgical techniques and chemotherapy regimens are providing modest improvements in survival, there is a clear need to better understand this aggressive disease to facilitate both earlier diagnosis and elucidate new targets for combination therapies. 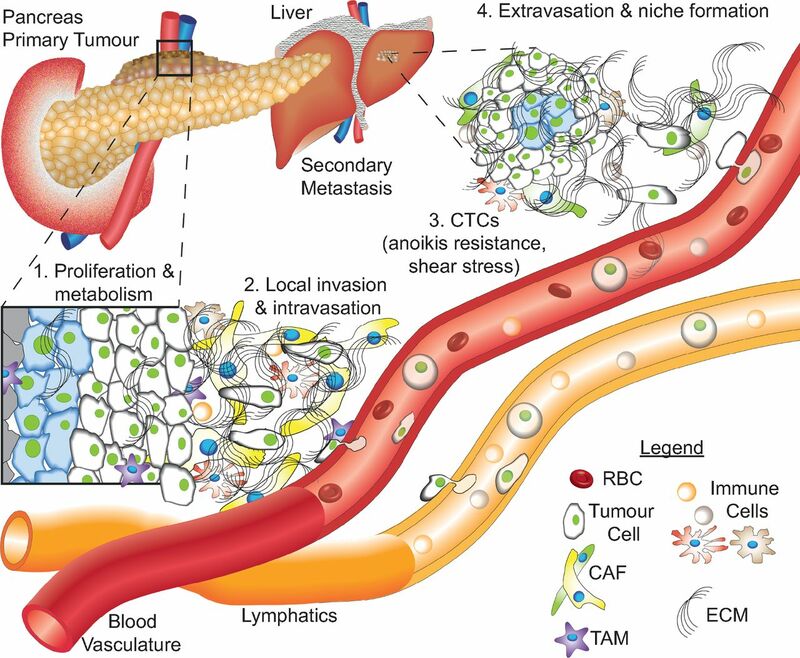 Schematic representation of PDAC progression from the primary tumour to a locally invasive disease and eventually metastasis. (1) Pancreatic cancer cells proliferate in the primary tumour, metabolising nutrients delivered by the blood vasculature and surrounding stroma. (2) Cancer cells invade through the extracellular matrix (ECM), including cancer-associated fibroblasts (CAFs) and tumour-associated macrophages (TAMs), among other cancer-associated cell types, eventually intravasating or invading into the lymph and travelling to distant sites. (3) Circulating tumour cells (CTCs) must develop resistance to anoikis, as well as shear stress, in order to survive in the circulation with red blood cells (RBCs) and leucocytes. (4) After travelling through the circulation, CTCs extravasate at secondary sites, commonly the liver, establishing a new niche. ECM, extracellular matrix; PDAC, pancreatic ductal adenocarcinoma. Attempts have been made to classify PanINs in terms of their mutational burden. Initially, evidence of telomere shortening and mutations in KRAS were found to occur very early in PanIN progression.36 37 This excluded KRAS as a potential marker for PDAC progression but highlights the general classification as the earliest initiator mutation in PDAC, occurring in ~95% of PDAC cases.26 38 Progression through to PanIN-2 and PanIN-3 typically includes additional mutations in TP53, SMAD4 and/or CDKN2A, but the vast molecular heterogeneity of this disease precludes any single mutation as essential for PDAC development.38 39 With this in mind, several large-scale sequencing and mass spectrometry approaches have been implemented to subtype the disease based on these molecular characteristics.40–43 The goal of such work is to better integrate biomarkers into the drug discovery pipeline, where lead compound development is performed hand in hand with biomarker identification (figure 2). This parallel preclinical development aims to foster a more personalised approach to clinical trial development, whereby each patient may be assessed for their respective molecular subtype and treatment is designed based on this result (figure 2). Adaptable drug development pipeline, demonstrating the progression of lead compounds through target validation, lead compound identification and optimisation, then preclinical validation. The necessary addition to this process is the identification of biomarkers to guide both lead compound development and later stratification in phase II/III clinical trials. These processes may be iterated to improve on-target efficacy, solubility and biomarkers. After safety and tolerability is confirmed in phase I clinical trials, biomarker-driven phase II/III may reduce the high attrition rates of lead compounds if appropriate patient stratification can demonstrate beneficial response in the assessed subsets of patients. These biomarkers may also provide opportunities for retrospective analysis and later iteration into clinical trials. PI3K, phosphoinositide 3-kinase. Physical microdissection approaches rely on IHC to inform stromal activation state and also limit the application of patient subtyping by molecular approaches due to a low sample throughput and smaller sample volume.48 As large datasets become increasingly common, new analytical approaches improve the readouts incurred. A more recent approach to PDAC subtyping involved virtual microdissection of large microarray datasets, facilitating molecular subtyping of both the tumour and the stroma.41 Using multivariate analysis to distinguish tumour and stromal components, the tumour was split into a classical and more aggressive basal-like subtype, and the stroma was classified into activated or normal subtypes (table 1, see column ‘Moffit’). This additional stromal subtyping was also recently applied to PDAC patient-derived xenograft (PDX) tumours, whereby tumours classified as basal or classical were shown to have an ‘echo’ in the mouse stroma.49 They further demonstrated the power of their classifications through inhibition of cholesterol uptake in subtyped PDX models, where basal tumours were highly sensitive to inhibition, but classical tumours were shown to have higher NPC1L1 expression and may require a greater concentration of inhibitor to achieve an equivalent growth inhibition. Patients were classified with this subtype if they showed evidence of high levels of immune infiltrate, which presents an inferred opportunity for emerging immunotherapies. This subtype shares several gene programmes (GPs) with the immunogenic subtype. It is defined by an increased activity of transcriptional networks associated with pancreatic endodermal cell fate. Pancreatic ductal adenocarcinoma (PDAC) associated with IPMN typically fell within this subtype, where an increase in fatty acid metabolism and O-linked glycosylation of mucins was upregulated. This subtype presented with higher activity of GPs associated with exocrine secretion, consistent with a more differentiated pancreatic lineage. Describing the most aggressive PDAC tumours, including the KPC GEM PDAC model, this subtype is defined by an upregulation of GPs associated with hypoxia, metabolic reprogramming, ECM deposition, squamous differentiation and proliferation. Antigens encoded by tumour-specific genes (neoantigens) are enriched in long-term PDAC survivors, along with high T cell infiltration. The quality of neoantigen may then provide a biomarker for emerging immunotherapies. Using 8 or 33 phosphosites as classifiers, the Australian Pancreatic Cancer Genome Initiative patient-derived cell lines or commercially available pancreatic cancer lines from the American Type Culture Collection were grouped into three subtypes based on their pTyr levels. Of these, subtype 3 in both cell line cohorts was enriched for receptor tyrosine kinase (RTK) phosphorylation and showed increased sensitivity to the epidermal growth factor receptor inhibitor erlotinib. This suggests that mass spectrometry approaches may provide a binary system for classifying patients into RTK or phosphoinositide 3-kinase pathway targeted therapies. The goal of this molecular phenotyping is to establish trials, such as IMPaCT, PRECISION-Panc, SHIVA, or biomarker-driven avatar trials (NCT02795650), where actionable molecular data guides therapies.55 56 These trials have established the feasibility of biopsy collection for pancreatic cancer within a clinical setting, where molecular assessment was performed by IHC or genomic approaches. However, biomarker-driven trials for pancreatic cancer remain infrequent, despite increasing evidence for a lack of stratification leading to late-stage failure. This is particularly evident for PI3K pathway inhibitors, where preclinical efficacy is driving their assessment in a clinical setting, but biomarker-driven trials in pancreatic cancer are sorely lacking (table 2). This is in stark contrast to the increase in biomarker-driven trials in other cancers, where biomarkers such as loss of phosphatase and tensin homolog (PTEN), PIK3CA mutation or Akt amplification/mutation are increasingly used to stratify patients for treatment with PI3K pathway inhibitors.57 Further to this goal, the subtyping approaches described above may also provide novel clinically actionable biomarkers or GPs to allow patient-selective assessment of PI3K pathway inhibitors to push PDAC survival beyond the current standard of care. A broad range of cancer types, including pancreatic cancer, have been candidates for targeting of the PI3K pathway, due to amplification, mutation or loss of key regulators.58 59 The PI3K pathway mediates transduction of signals from both extracellular and intracellular sources, including growth factors and nutrients, leading to downstream signalling involved in cancer growth, survival and progression (figure 1).58 60 61 The pathway is also essential for many cancer-associated activities, including endothelial cell sprouting for angiogenesis, macrophage transcriptional reprogramming, T cell differentiation and homeostasis and fibroblast-supported chemoresistance (figure 1).62–65 Collectively, this suggests that application of PI3K pathway inhibitors as a PDAC therapy may provide an opportunity for dual targeting of cancer cells and the deregulated cancer-associated stromal components. Several signalling pathways are known to converge on the MAPK and PI3K pathways as effectors of cellular response within the cell. For example, in ~95% of cases, pancreatic cancer is driven by activating mutations in KRAS, which in turn activates PI3K signalling through the p110α subunit, along with another pathway component PDK1, indicating that a large proportion of patients could benefit from effective targeting of this pathway (figure 3).28 73–76 Furthermore, detection of mutations in PIK3CA can be predictive for improved patient response in preclinical models of PDAC and in patients with breast cancer stratified according to detection of mutations in circulating cell-free DNA.74 77–79 Given the varied roles of different PI3K isoforms in both the tumour and associated stromal cells, isoform-specific inhibitors provide isolated targeting of oncogenic signalling and allow redundancy to alleviate off-target side effects in healthy tissues (table 2; reviewed in refs 80 81). Notably, a PI3Kα-specific inhibitor has shown promising efficacy in combination with an EGFRi in PDAC with high EGFR and Akt phosphorylation.82 Interestingly, PIK3CA mutations in breast cancer have also been linked with Akt-independent tumour progression through SGK3 and highlight the importance of all levels of this key signalling cascade.83 Similarly, isoform-specific PI3Kβ inhibition extended PDAC survival beyond mTORC1/2 targeting alone,84 and in other cancers, inhibition of PI3Kβ and PI3Kδ has shown antimetastatic effects and suggests a role of PI3K in tumour metastatic dissemination.85 86 Furthermore, isoform-specific inhibition of PI3Kδ in cancer-associated immune cells was shown to downregulate their tolerance to PDAC, which improved the activity of T cells against the cancer.87 Collectively, we see strong evidence accumulating for the efficacy of upstream isoform-specific targeting of PI3K in emerging PDAC combination therapies. Concordantly, evidence for the validity of downstream pathway targeting is highlighted in a genetically engineered mouse model of mutant KrasG12D-driven PDAC, which was applied in concert with a sleeping beauty transposon library, both conditionally expressed (ie, LSL-KrasG12D and LSL-SB11) under pancreas-specific Pdx1-Cre.88 89 These approaches identified several genes within the MAPK and PI3K pathways as cooperating mutations for KrasG12D-driven PDAC. Similarly, recent assessment of kinases with the highest levels of absolute and differential expression in a panel of pancreatic cancer cell lines demonstrated significantly reduced cell number after knockdown of EGFR, Akt2, PLK2 or MET.90 This review will focus on PI3K pathway targeting in PDAC (see also table 2, PI3K pathway inhibitors under clinical investigation in PDAC). After the discovery and isolation of rapamycin on the island of Rapa Nui from Streptomyces hygroscopicus, over 30 years of research continues to find new therapeutic applications for this compound.91 For example, the mTOR inhibitor (mTORi) rapamycin was recently assessed in PDAC driven by activated PI3K/AKT signalling via PTEN loss, where targeting of mTORC1 by rapamycin significantly reduced the onset and progression of the disease (figure 3).92 Work to improve the solubility and bioavailability of rapamycin-based compounds (rapalogs) has seen modification at the C-42 position through addition of an ester, ether or phosphonate group to generate temsirolimus, everolimus and ridaforolimus, respectively.60 Clinical trials in pancreatic neuroendocrine tumours (pNETs) have demonstrated a clear benefit for rapalogs as single agents (table 2);93 however, no significant improvements have been identified for rapalogs as single agents in PDAC.94 95 This has been attributed to an upstream feedback loop where inhibition of mTORC1 alone relieves the inhibitory phosphorylation of insulin receptor substrate 1 (IRS1)by p70-S6K and mTORC1, leading to an upregulation of Akt phosphorylation (figure 3).96 97 Hence, while trials of rapalogs may benefit from stratification for patients with high PI3K pathway activity, newer agents that target both mTORC1 and mTORC2, or other pathway components, allow the negation of this feedback loop with promising therapeutic potential (table 2).84 98 Importantly, new combination therapies with rapalogs should consider the combined toxicity with other targeted compounds. For example, combination of everolimus with the RTKi cetuximab was found to be too toxic for patients with PDAC in a phase I/II clinical trial, while the single agents show minimal toxicity.94 99 100 With this in mind, trials are still ongoing in PDAC using rapalogs in combination therapies (table 2). Next-generation dual PI3K pathway inhibitors are being developed that take advantage of the homology of the kinase domains from class I, II and III PI3Ks and those of phosphoinositide 3-kinase-related kinases, such as mTOR, ATM and DNA-PK (figure 3, table 2).101 However, these dual inhibitors have been linked with drug-related dosage-dependent toxicities, such as hyperglycaemia, nausea, vomiting and diarrhoea, consistent with PI3K isoform targeting, and reinforce the need for preclinical assessment of the additive or synergistic toxicities when developing novel combination therapies.81 Moving forward, improvements in solubility are driving greater oral bioavailability, where lower drug dosages can show equivalent drug efficacy and gastrointestinal toxicities are readily reduced.102 103 One exciting example of a dual PI3K pathway inhibitor is AZD2014, which was developed by iterative structure–activity relationship medicinal chemistry approaches to have high aqueous solubility and a potent inhibitory effect against both mTORC1 and mTORC2.104 Recent preclinical work by our group has demonstrated potent antiproliferative and anti-invasive effects in the KPC (LSL-KrasG12D, LSL-Trp53R172H and Pdx1-Cre) GEM PDAC model84 105 and after a promising phase I clinical trial in advanced solid tumours (AdvSTs), AZD2014 has progressed to phase II biomarker-driven clinical trials either alone or in combination with a MAPK/ERK kinase inhibitor (MEKi) (table 2).98 The additional anti-invasive role for AZD2014 is consistent with increasing evidence for the emerging antimetastatic and anti-invasive effect of PI3K pathway targeting (figure 1).105–109 Indeed, the opposing roles for the different Akt isoforms in cell motility have identified an invasion and metastasis promoting role of Akt2 but an inhibitory role for Akt1.110–114 The dual role of Akt1 in either promoting tumour growth or metastasis was recently shown to be regulated by the inositol polyphosphate 5-phosphatase (PIPP), where PIPP ablation resulted in reduced metastasis but increased tumour growth.108 Similarly, mTORC1 and mTORC2 have been shown to regulate migration and invasion through Rac1 and RhoA.58 80 115 Furthermore, mTOR inhibition dramatically reduced metastasis in prostate cancer, highlighting the broader potential of PI3K pathway therapeutics as antimetastatic agents.116 Intriguingly, the mTOR inhibitor, everolimus, resulted in a partial response in a patient with pancreatic cancer that was induced by Peutz-Jeghers syndrome (PJS).117 PJS is caused by a tumour-suppressor gene mutation in the serine threonine kinase 11 gene (STK11, also known as LKB1), which results in ~11%–36% of patients with PJS developing pancreatic cancer.117 This loss of STK11 leads to a loss of suppression of mTOR signalling and raises the tantalising possibility that mTOR inhibition could have monotherapy efficacy in PDAC in selected cases with a similar genetic background. The RTK family comprises several subfamilies that are not limited to ErbB, fibroblast growth factor receptors (FGFRs), insulin and insulin-like growth factor receptors, platelet-derived growth factor receptor (PDGFR), vascular endothelial growth factor (VEGF) receptor (VEGFR) and Axl and the Ephrin receptors. Inhibition of these receptors using RTK inhibitors (RTKi) generally takes one of three forms: antibody or recombinant protein inhibition of the extracellular ligand binding domain, inhibition of the ligand itself, or targeting of the cytoplasmic tyrosine kinase domain. In recent work, 19 PDAC cell lines from the American Type Culture Collection and 17 patient-derived cell lines (PDCLs) from the Australian Pancreatic Cancer Genome Initiative collection, sequenced as part of the International Cancer Genome Consortium (ICGC), were used to assess global phosphotyrosine (pTyr) profiles in PDAC by mass spectrometry.43 This approach allowed the authors to define two sets of classifier mutations (8 and 33 pTyr sites) that predicted three PDAC subtypes over the two cell line panels (box 1). Interestingly, when RTK activity was enriched, the cell lines showed an enhanced sensitivity to the EGFRi erlotinib, suggesting that this subtyping approach may provide a method to stratify patients for RTK-targeted therapies. While the somatic mutation profiles did not correlate with the pTyr-based subtyping, similar GPs were identified between both the genomic and mass spectrometry studies.42 43 However, at the mass spectrometry level, it was possible to identify the activation status of kinase networks and receptors. This lends weight to the overlapping use of both genomic and mass spectrometry approaches to assess aberrant pathway expression, mutation status and, importantly, activation state and provides clear motivation for the incorporation of both techniques into the drug discovery pipeline (figure 2). RTKs are transmembrane receptors that communicate signals from ligands outside of the cell by activating their cytoplasmic tyrosine kinase domains, which facilitate downstream signalling within the cell, typically through activation of the MAPK and PI3K pathways. The ErbB family contains four RTKs structurally related to the epidermal growth factor receptor (EGFR; human epidermal growth factor receptor (HER) 1 and ErbB-1). EGFR expression is observed in normal pancreatic ducts but has been shown to increase from the early stages of PanIN development through to PDAC.118–120 Targeting of the EGFR receptor with the small molecule inhibitor erlotinib in combination with gemcitabine resulted in a statistically significant, but clinically modest, improvement in overall survival compared with gemcitabine monotherapy in patients with metastatic disease and has also been evaluated in the adjuvant setting.121 122 These studies subsequently motivated the assessment of predictive markers that would stratify patients for this treatment.123–126 These studies found conflicting evidence for KRAS mutational status as a predictive or prognostic marker for erlotinib response but suggested that mutations or amplification of EGFR may be sufficient to stratify patients for therapy. Interestingly, expression of ErbB-3 (HER3) has been associated with sensitivity to erlotinib treatment in pancreatic cancer cell lines and therefore may prove an effective biomarker for adjuvant erlotinib for patients with PDAC.127–129 ErbB-3 requires heterodimerisation for downstream signalling through the PI3K pathway and expression in PDAC is a poor prognostic factor for survival.127–129 Another emerging personalised approach to PDAC therapy comes from the success of targeting ErbB-2 (neu and HER2) amplified tumours with a humanised monoclonal antibody.130 ErbB-2 amplification in PDAC has a relatively low prevalence of 2%;50 131 132 however, clinical trials with trastuzumab (Herceptin) in combination with chemotherapy have shown beneficial responses in metastatic PDAC patients with ErbB-2 amplification,133 134 and studies are still ongoing in metastatic or recurrent PDAC.56 ErbB-4 (HER4) is the last member of the ErbB family but is only weakly expressed in PDAC.135 136 However, given the established importance of the other ErbB family members in PDAC progression, they may also prove effective biomarkers for inhibition of the PI3K pathway, which is less sensitive to changes in receptor dimerisation. Due to the highly desmoplastic reaction characteristic of PDAC, it is important to consider the stromal responses to therapies and even look for new targets within this compartment. Moreover, the effect of FGFR targeting in stromal pancreatic stellate cells has also demonstrated a beneficial outcome by reducing cancer cell invasion and hence better containing the tumour.139 This suggests that PI3K pathway inhibition may also have an antistromal effect that reduces the protumourigenic role of the activated cancer-associated fibroblasts and stellate cells, but as yet, this effect has not been assessed. Interestingly, overexpression of FGFR has also been used in a less conventional approach, where targeting this cell-surface receptor with an antibody-conjugated adenovirus specifically delivered a viral gene.140 This viral gene then predisposed these cells to antiviral therapy by ganciclovir. While this work has not progressed beyond preclinical models, other alternative therapies, such as antibody-conjugated nanoparticles, toxins, viruses or CAR-Ts,141–144 highlight the variety of emerging therapies that could potentially combat this primarily treatment-refractory disease. The largest known RTK family is that of the Ephrin receptors, of which both the EphrinA and EphrinB subfamilies are associated with poorer survival in patients with PDAC and are predictive of tumour proliferative and growth capacity.155 156 Indeed, increased activity of EphrinA2 has been associated with Kras-driven PDAC progression and knockdown in a mouse model of PDAC decreased metastasis.43 157 Furthermore, axon guidance GPs in which EphrinA5 and EphrinA7 play a role have been implicated in PDAC development, providing further motivation for application of the EphrinA/EphrinB receptors as predictive biomarkers for aggressive disease.38 Their continued association with PDAC has led to several approaches to therapeutically target these receptors.158 For example, a recent toxin-conjugated monoclonal antibody against the EphrinA2 receptor MEDI-547 completed phase I clinical trials in treatment-refractory solid tumours.159 Similarly, the broad-spectrum small molecule tyrosine kinase inhibitor dasatinib has an established inhibitory effect on the intracellular kinase domains of Ephrin receptors and provides a parallel approach for targeting of other RTKs.160 After promising preclinical studies, dasatinib has progressed to clinical trials for metastatic PDAC in combination with FOLFOX (NCT01652976) or gemcitabine/erlotinib (NCT01660971) chemotherapy.161–163 However, dasatinib in combination with gemcitabine did not improve overall compared with gemcitabine and placebo in locally advanced, non-metastatic PDAC.164 Another common approach to target upregulated Ephrin signalling is to inhibit the downstream pathways, such as the MAPK or PI3K pathways.158 Importantly, as PDAC therapy necessarily turns towards predictive biomarkers to guide personalised therapies, upregulation of Ephrin family members may predict response to RTK, MAPK or PI3K pathway inhibition in PDAC. The membrane-bound TGFβ receptor is mutated at a relatively low frequency in PDAC.50 70 However, disruptions in other pathway components occur in ~47% of patients, including mutations in SMAD4, SMAD3, TGFBR1, TFGBR2, ACVR1B and ACVR2A.42 There is a complex relationship between TGFβ signalling and either tumour suppression or metastatic spread.165 Indeed, loss of SMAD4 is indicative of a poorer prognosis, while TGFβ pathway activation is associated with an epithelial-to-mesenchymal transition, one of the driving factors for metastatic dissemination.165 166 This has made TGFβ signalling the focus of recent clinical trials combining TGFβ receptor inhibition with gemcitabine (NCT02154646 and NCT01373164) or immunotherapy (NCT02734160). However, these trials are not biomarker driven and hence are not stratified for SMAD4 mutational status, which is associated with failure of adjuvant chemotherapies in PDAC.167 168 The role of SMAD4 in TGFβ signalling is primarily tumour suppressive, and this function may limit application of TGFβ receptor inhibitors, where they would best be applied to patients with SMAD4 deletion.169 A key non-canonical mediator of TGFβ signalling is the PI3K pathway, which was shown to be inhibited by TGFβ receptor inhibitors and activated by endogenous TGFβ.165 170 171 Hence, an alternative route, independent of the tumour-suppressive functions of TGFβ signalling, may be through inhibition of these non-canonical signalling pathways. Aberration in DNA damage repair pathways, such as mutations in BRCA1, BRCA2, PALB2 or ATM, are commonly associated with increased risk of familial pancreatic cancer,172 173 but also occur in the later stages of PanIN development and PDAC.18 20 42 56 Loss of these DNA repair proteins leads to genomic instability and predisposes patients to breast, ovarian, prostate and pancreatic cancers.174–176 Patients with mutations in this pathway in other cancers have shown beneficial responses to PARPi, and recent clinical trials in PDAC have been performed to assess the beneficial role of second-line olaparib monotherapy in BRCA1/2-deficient patients, following failure on gemcitabine.177 PARPi work on the basis of synthetic lethality whereby tumours with defects in double-stranded DNA repair pathways become dependent on PARP to repair the resultant collapsed replication forks and maintain chromosomal stability and cell cycle progression.178–180 Another option for patients with mutations in DNA repair pathways is by causing further DNA damage in these defective cells by either platinum-based therapies or mitomycin C.56 181 Furthermore, the PI3K pathway has a well-established role in DNA damage repair, and promising combination therapies in endometrial and breast cancers have motivated clinical trials in PDAC to assess the effect of PARPi in combination with PI3K pathway inhibitors (table 2, figure 3).182–184 The clear responses seen in patients presenting with these DNA repair defects provides a promising personalised approach to therapy when standard of care is found to be ineffective. Loss or mutation of the tumour suppressor p53 occurs in ~75% of patients with PDAC, where gain-of-function mutations occur at a higher prevalence and are thought to provide a growth advantage, as well as driving metastatic progression.50 191 192 The primary role of p53 is to bind DNA as a transcriptional activator or repressor, mediating transcriptional networks responsible for cell death and replicative senescence in response to genotoxic or oncogenic stress.193 194 HDACs work by regulating gene expression at an epigenetic level and have been associated with upregulation of mutant p53 in several cancers, including PDAC.195 196 Furthermore, several HDACs are overexpressed in PDAC, prompting assessment of the clinical benefit of their inhibition.197 198 Recently, a phase I clinical trial of vorinostat with chemoradiation in PDAC showed promising overall survival benefits.199 In parallel, emerging studies in other AdvSTs demonstrated promising synergistic benefits when combining vorinostat with the broad-spectrum RTKi sorafenib200 201 and subsequently led to a new phase I trial of vorinostat and sorafenib with chemotherapy in PDAC (NCT02349867). Simplified schematic of the PI3K pathway, which highlights the common targets for small molecule inhibitors. Briefly, signalling from growth factors activates RTKs and recruits PI3K and other scaffold proteins to the cell membrane, where PIP2 is converted to PIP3. This recruits phosphoinositide-dependent kinase-1 (PDK1) and Akt to the membrane and leads to downstream signalling through the kinase activities of Akt. (1) Single-strand break repair is regulated primarily by PARP and inhibition of PARP can lead to genomic instability. (2) Double-stranded break repair is primarily regulated by a complex with BRCA2, which is lost in familial pancreatic cancer and some PDAC cases and can lead to genomic instability. 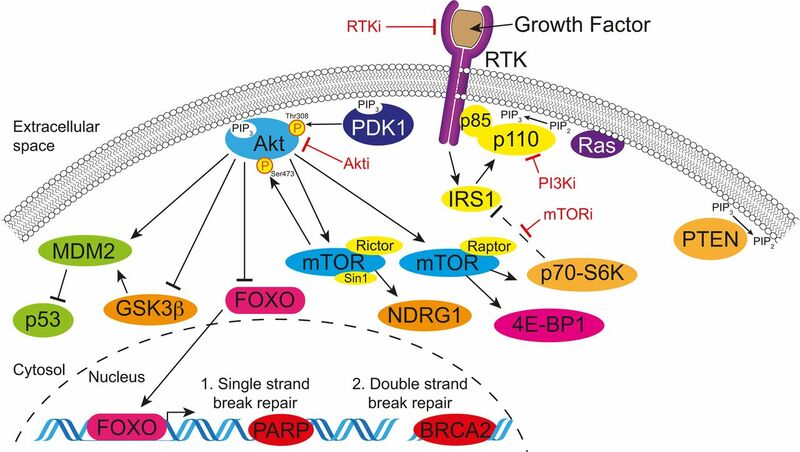 Genomically unstable tumours require the PI3K pathway to maintain survival pathways and PI3K pathway inhibition may be an emerging option for patients with BRCA2 mutations or in combination with PARP inhibitors. More exhaustive pathway maps can be found in refs 61 80. P13K, phosphoinositide 3-kinase; RTKs, receptor tyrosine kinases. Schematic of the formation of a hypoxic environment and the potential targeting of this microenvironment with HAPs. RBCs transport oxygen through the blood vasculature, and hypoxia forms when this diffusion-limited process delivers insufficient oxygen to cells distant to the vasculature (blue cells). The extreme case of anoxia (grey cells) regularly results in necrotic cell death. HAPs take advantage of the hypoxic environment of tumours to deliver cytotoxic compounds to these tumour regions, where the prodrug is either enzymatically cleaved by the cells metabolic machinery or undergoes a conformational change in response to the low oxygen partial pressure. HAPs, hypoxia-activated prodrugs; RBCs, red blood cells. Moving forward, the design and synthesis of HAPs with defined molecular targets are emerging for specific applications. For example, hypoxia-activated chk1 inhibitors were recently developed as proof-of-principle molecules for targeting the hypoxic compartment of tumours, where chk1 is an important component of the DNA damage response and cell cycle progression.261 From these studies, it is clear that the emerging application of microenvironmental-targeted agents in combination therapies can improve patient outcomes, and as newer generation inhibitors are developed, we are likely to see a wider application of these agents entering the clinic. Given the lagging improvements in therapy, there is a dire need to find new biomarkers and targets to move pancreatic cancer towards personalised medicine approaches (figure 2). To guide clinical success, emerging combinations would benefit from a preclinical platform of evidence in at least one in vivo model, as well as optimisation of solubility for reduced toxicity and, importantly, identification of at least one suitable biomarker for patient stratification at the level of clinical trials (figure 2). The emerging efficacy of PI3K pathway inhibitors for PDAC and the convergence of several aberrantly expressed signalling cascades highlights a clear progression towards their application for this disease. For example, patients with aberrant DNA damage repair pathways have responded well to PI3K pathway inhibition as part of combination therapies, and trials are already underway in PDAC. Furthermore, given the complex dimerisation of the ErbB family of RTKs and the association of Ephrin receptors with more aggressive PDAC subtypes, RTKs may provide biomarkers for patients that would respond efficaciously to PI3K pathway inhibition. Moving forward, one of the key goals of the ICGC2 is to link bioinformatics approaches, such as molecular subtyping of patients, to clinical data, and we expect this to drive an increase in biomarker-driven clinical trials (proposed in box 2). This is a necessary step to decrease the attrition of lead compounds in the pharmaceutical industry and to ensure that next-generation inhibitors progress to patients that are appropriately subtyped for maximum benefit. What may improve clinical trials? Patient subtyping from tumour biopsies by genomic and/or mass spectrometry approaches. Biomarker identification prior to progression to phase II/III studies to ensure appropriate patient stratification for maximal benefit (circulating cell-free DNA/genomic approaches/IHC). Incorporation of non-invasive imaging for hypoxic tumour burden, such as electron paramagnetic resonance imaging, MRI or positron emission tomography with 18F-fluorodeoxyglucose. Testing of promising lead compounds against stratified patient-derived xenograft/Avatar cohorts prior to phase I clinical trials. Development of new prodrugs to use in combination therapies with reduced off-target effects. Raising the bar when defining preclinical ‘success’. The authors would like to thank Dr Marina Pajic, Dr David R Croucher and Kendelle J Murphy for critical reading of the manuscript.
. Cancer statistics. CA: a cancer journal for clinicians, 2018;68:7–30.
. Cancer statistics. CA: A Cancer Journal for Clinicians;2000:50:7–33.
. Progression model for pancreatic cancer. Clin Cancer Res 2000;6:2969–72.
. Update on pancreatic intraepithelial neoplasia. Int J Clin Exp Pathol 2008;1:306–16.
. Pancreatic intraepithelial neoplasia in association with intraductal papillary mucinous neoplasms of the pancreas: implications for disease progression and recurrence. Am J Surg Pathol 2004;28:1184–92.
. p16 and K-ras gene mutations in the intraductal precursors of human pancreatic adenocarcinoma. Cancer Res 1997;57:2140–3.
. Overexpression of AKT2/protein kinase Bbeta leads to up-regulation of beta1 integrins, increased invasion, and metastasis of human breast and ovarian cancer cells. Cancer Res 2003;63:196–206.
. Coexpression of epidermal growth factor receptor and ligands in human pancreatic cancer is associated with enhanced tumor aggressiveness. Anticancer Res 1993;13:565–9.
. The correlation between cytoplasmic overexpression of epidermal growth factor receptor and tumor aggressiveness: poor prognosis in patients with pancreatic ductal adenocarcinoma. Pancreas 2004;29:e1–8.
. Enhanced erbB-3 expression in human pancreatic cancer correlates with tumor progression. Clin Cancer Res 1995;1:1413–20.
. Combination treatment with hypoxia-activated prodrug evofosfamide (TH-302) and mTOR inhibitors results in enhanced antitumor efficacy in preclinical renal cell carcinoma models. Am J Cancer Res 2015;5:2139–55.
. Dual action of tirapazamine in the induction of DNA strand breaks. Cancer Res 1996;56:1584–90. Contributors JRWC and PT developed the main concept of the manuscript. All authors wrote the manuscript. JPM and PT wrote grant applications that funded the work. Funding This work was supported by an Nation Health and Medical Research (NHMRC) project grant, an NHMRC fellowship, an Nation Breast Cancer Foundation (NBCF) grant, an Australian Research Council (ARC) Future fellowship, a Len Ainsworth Pancreatic Cancer Fellowship, Cancer Council NSW grant, a Tour de Cure grant and Cancer Research UK (CRUK) core funding (A17196 and A21139). This project was made possible by an Avner Pancreatic Cancer Foundation Grant.